This is the ULTIMATE Oatmeal Cookie Recipe! These classic oatmeal cookies are perfectly tender, perfectly sweet, and a little bit chewy! 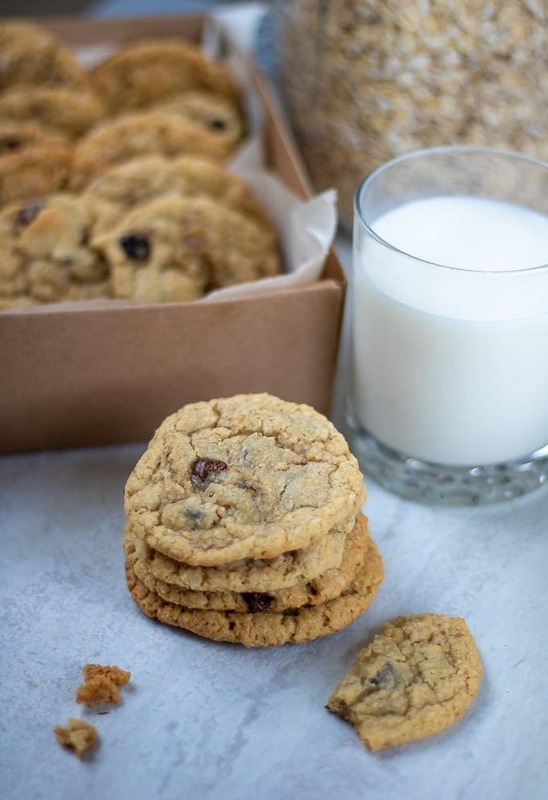 Start with the best oatmeal cookie dough recipe and then add in a variety of combinations for Oatmeal Chocolate Chip Cookies, Oatmeal Raisin Cookies, Cranberry Orange Oatmeal Cookies, and Coconut Oatmeal Cookies. This is the ONLY Oatmeal Cookie Recipe you will ever need! Oatmeal cookies are one of my favorite cookies. PERIOD. And my family agrees, my recipe for Oatmeal Cookies is hands-down the best Oatmeal Cookie they have ever had. This oatmeal cookie recipe starts with a simple oatmeal cookie dough that produces a perfectly tender yet slightly chewy oatmeal cookie that is just sweet enough. But the best part about this oatmeal cookie recipe? It can be customized based on your preference. Whether you want Oatmeal Chocolate Chip Cookies, Oatmeal Raisin Cookies, Cranberry White Chocolate Oatmeal Cookies, or Coconut Oatmeal Chocolate Chip Cookies, this recipe for oatmeal cookies is the recipe you have been looking for! Start by placing out butter and eggs several hours before preparing cookies. This will allow your ingredients to come to room temperature, which will help your batter to blend up better. 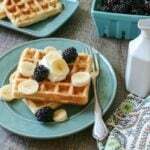 This oatmeal cookie recipe is unique in that I blend my oats before adding to my batter. This blended oatmeal gives these cookies just the right amount of chew, while allowing the cookie to still be soft and fluffy. It is a step you do NOT want to skip. In large bowl, mix together dry ingredients until well combined. In a stand mixer or large mixing bowl, cream together butter and sugar until light and fluffy, about 3-5 minutes. Add in eggs and vanilla extract and mix until light in color and batter is combined. Slowly add in dry ingredients to butter mixture, mixing until JUST combined. At this point, you can add mix-ins to your oatmeal cookie dough or you can proceed with recipe for delicious plain Oatmeal Cookies. Refrigerate dough for 30 minutes, or up to 1 hour. Roll 1 tablespoon cookie dough into balls and place on cookie sheet, 2 inches apart from each other. Bake for 6-8 minutes or until just set. Cool on baking sheet for 2 minutes and then remove to cooling rack to cool completely. These oatmeal cookies are delicious plain or you can mix in a variety of flavors to create an Oatmeal Cookie that your family will love. You can even divide the base into 4 portions and flavor each batch in a different way. 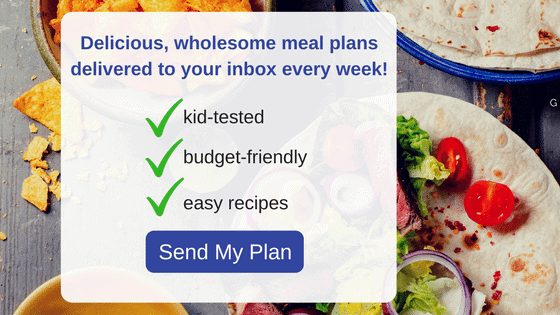 I personally love this method as it satisfies everyone in my family and any craving I may have. Plus it is a lot less work to make one cookie 4 ways than 4 different types of cookies. Mix in 2-3 cups semi-sweet chocolate chips into the cookie batter if preparing entire recipe as Chocolate Chip Oatmeal Cookies. 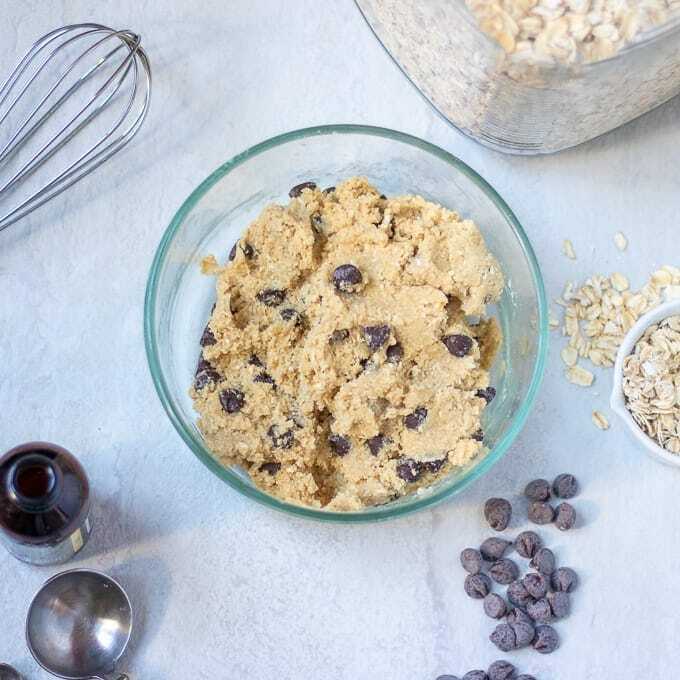 If using 1/4 recipe, mix in 1/2- 2/3 cup chocolate chips into oatmeal cookie dough before refrigerating. Mix in 1 cup semi-sweet chocolate chips, 1 cup shredded coconut and 1 cup chopped almonds (optional) into the cookie batter if preparing entire recipe as Coconut Oatmeal Cookies. 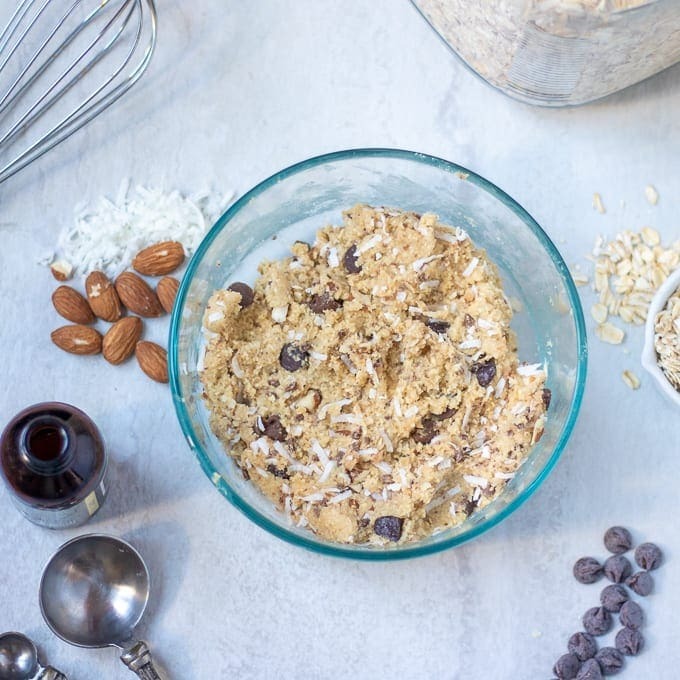 If using 1/4 recipe, mix in 1/4 cup chocolate chips,1/4 cup shredded coconut and 1/4 cup chopped almonds into oatmeal cookie dough before refrigerating. This version of oatmeal cookies mimics the flavors of an Almond Joy, but you can leave nuts out or chocolate chips out if desired and just add in coconut. I still would only use 1 cup as the coconut will overwhelm the cookie if you use much more. 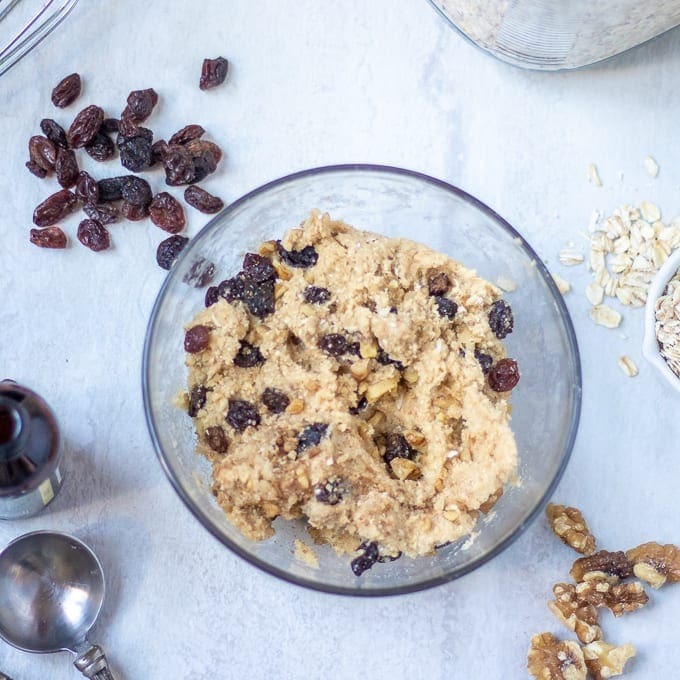 Mix in 2 cups raisins, 1 teaspoon cinnamon, and up to 1 cup chopped walnuts (optional) into the cookie batter if preparing entire recipe as Oatmeal Raisin Cookies. If using 1/4 recipe, mix in 1/2 cup raisins, 1/4 teaspoon cinnamon and 1/4 cup chopped walnuts into oatmeal cookie dough before refrigerating. Mix in 2 cups dried cranberries, 1 cup white chocolate morsels and 1 teaspoon orange zest into the cookie batter if preparing entire recipe as White Chocolate Cranberry Oatmeal Cookies. 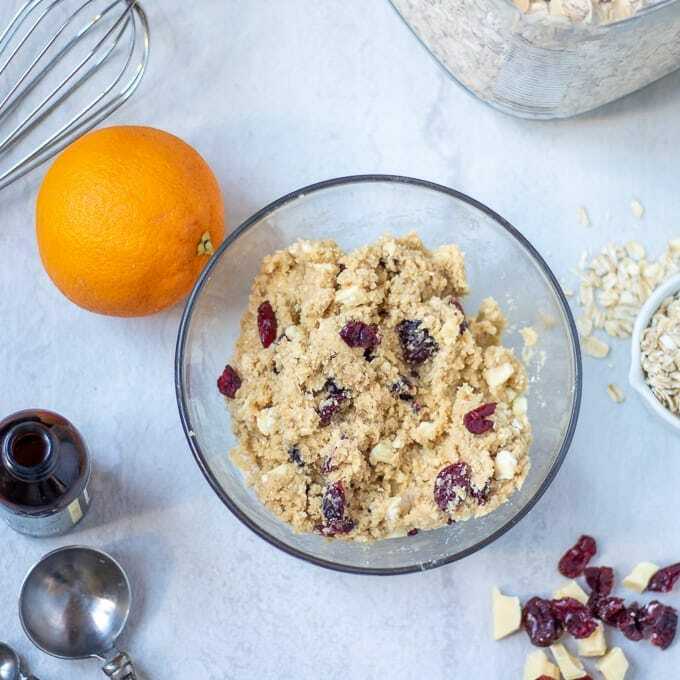 If using 1/4 recipe, mix in 1/2 cup dried cranberries, 1/4 cup white chocolate, and 1/4 teaspoon orange zest into oatmeal cookie dough before refrigerating. Place cooled oatmeal cookies in air tight container, or bag for up to 5 days. Add a slice of bread to container to keep cookies soft. Place baked, cooled oatmeal cookies in air tight container, layered between sheets of parchment paper. Store in freezer for up to 6 weeks for best flavor. I don’t recommend freezing cookies in freezer bag, as baked cookies are fragile and may break in freezer. Once your cookie dough is prepared, roll into 1 tablespoon balls and place on cookie sheet. Place frozen cookie dough balls into freezer safe bag and freeze for up to 3 months. When ready to bake, place frozen cookies on baking sheet. Bake at 375 for 9-11 minutes. Which Oats are best to use? For oatmeal cookies, use quick cook or old fashioned oats. Do NOT use steel cut oats. By blending the oats, the cookie will be smoother, yet still have some chew. Place oats into your blender and whirl away until a powdery substance forms–about 1-3 minutes depending on strength of blender. The important part of this is to measure the oats AFTER you blend them, not before–baking is a science. These classic oatmeal cookies are perfectly tender, perfectly sweet, and a little bit chewy! . This is the ONLY Oatmeal Cookie Recipe you will ever need! In a large mixing bowl or stand mixer, cream butter and sugars together until fluffy and light in color--about 3-5 minutes. Add the eggs and vanilla and beat until well combined. Using a tablespoon for each cookie, roll into a ball. Mix in 2-3 cups chocolate chip into batter before refrigerating. Mix in 1 cup semi-sweet chocolate chips, 1 cup shredded coconut and 1 cup chopped almonds (optional) into the cookie batter before refrigerating. Mix in 2 cups dried cranberries, 1 cup white chocolate morsels and 1 teaspoon orange zest into the cookie batter before refrigerating. Mix in 2 cups raisins, 1 teaspoon cinnamon, and up to 1 cup chopped walnuts (optional) into the cookie batter before refrigerating. This recipe calls for 2 1/2 cups of blended oatmeal. Place oats into your blender and whirl away until a powdery substance forms. The important part of this is to measure the oats AFTER you blend them, not before–baking is a science. These are SO tasty! They’ll definitely be making an appearance on our holiday baking line up! They do make a great option for the holidays! Enjoy! I love oatmeal raisin cookies and they were my fathers favorite too so in addition to being yummy they hold a special place in my heart. I can’t wait to try all of these cookies too! Oh Julie, I love the memories attached to food. 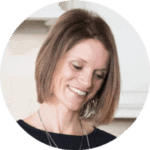 Thank you for sharing the story of your father with me!